Rafael Montero is barely a below-average pitcher. On Wednesday, though, everything clicked perfectly into place, and the 26-year-old with a career 5.14 ERA pitched 8.1 masterful innings against the Reds. “I’ve regained the confidence that I had when I was in the minor leagues,” Montero said, and “I think that confidence is definitely back.” He allowed consecutive one-out hits in the ninth, so A.J. Ramos came in to secure the victory. The Mets’ other two games against the Reds were less inspiring. Chris Flexen started on Tuesday, and the 56-75 Reds exploded for 14 runs. Outfielder Scott Schebler cracked his first career grand slam, Adam Duvall hit a three-run homer, and Sal Romano pitched six decent innings. The Reds rode another power display on Thursday to an easy 7-2 victory. Jacob deGrom allowed four runs over six innings as Scooter Gennett, who was previously a ‘field-first, low-hit’ infielder, cracked his career-high 23rd home run, while Joey Votto and Stuart Turner added blasts of their own. Due to the lingering horrors of Tropical Storm Harvey, the Mets’ Friday game was postponed into a Saturday doubleheader. 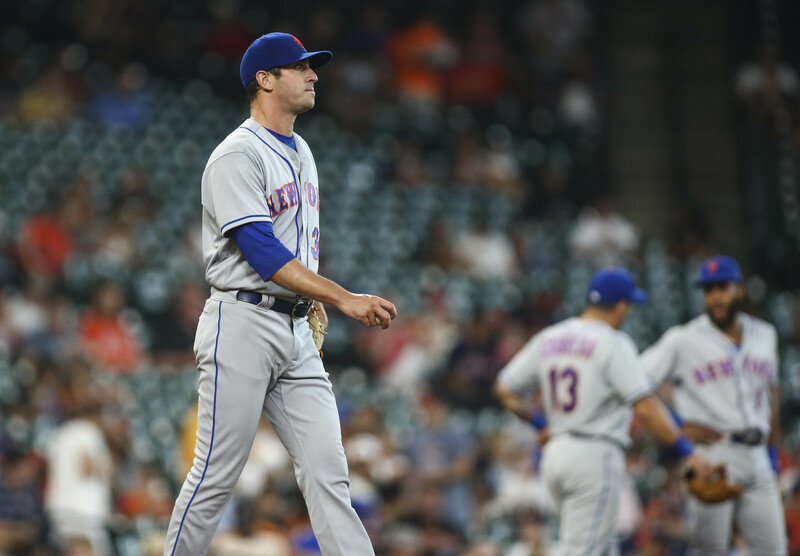 As an unfortunate coincidence, Matt Harvey pitched the first game in Houston. It was the shortest (and perhaps the most unfortunate) start of his career. He allowed seven runs over two brutal innings, including a two-run homer to George Springer. David Wright’s rehab assignment with the High-A St. Lucie Mets was terminated this week after only two games. The veteran third baseman experienced shoulder pain, a problem that shut him down this spring training, and he’s now consulting with doctors in New York. Mets manager Terry Collins also believes that Wright was feeling discomfort before playing in the rehab games. Tim Tebow was a spectacle in St. Lucie this year, where thousands of fans flocked to watch the 30-year-old ex-quarterback hit .226/.306/.344 with eight home runs. This week, Tebow told the Associated Press that he plans to keep playing baseball in 2018. “For me it’ll be about working on training and building the muscle-memory where I can do it for two, five, seven days and continue to build a couple of weeks at a time,” he said. It remains to be seen whether Tebow will be a September call-up for the Mets. He’s probably not worthy on the merits, but his promotion would bring some much-needed excitement to Queens. GCL right-handed pitcher Jose Sierra was suspended for 56 games after testing positive for Stanozolol. The 19 year-old had an 0.00 ERA in 11 relief appearances for the Gulf Coast Mets. The Mets are sending four players from Double-A Binghamton to play in the 2017 Arizona Fall League: Tomas Nido (C), Luis Guillorme (INF), David Thompson (3B), and Kevin Kaczmarski (OF). Each team sends six prospects to the premier league, so the Mets have two roster spots remaining. In “The Great Gatsby,” Jordan said that “Life starts all over again when it gets crisp in the fall.” His words apply awfully well to September call-ups, which, at their best, can reinvigorate aging major league rosters with fresh young talent. The Mets began this process by calling up relievers Jacob Rhame and Jamie Callahan from Triple-A Las Vegas. Rhame was acquired from the Dodgers in the Curtis Granderson deal, and Callahan was sent over from Boston in exchange for Addison Reed. Reportedly, sources within the Mets organization are worried that Conforto’s rehab “could last into spring training and beyond.” He will undergo surgery soon to address a tear in his joint’s posterior capsule, which he sustained after whiffing on a pitch on Aug. 24. On Saturday, the Mets signed 35-year old outfielder Nori Aoki to a major league contract. Aoki was released by the Blue Jays earlier this week, but the Mets now have control over him until 2018. He joined the team for their series in Houston. After hitting his first career grand slam on Sunday night, Wilmer Flores fouled a ball off his face. He immediately fell to the ground, writhing in pain, while blood spurted from his nose. Terry Collins said that they won’t know long Flores will be out until he visits a specialist. However, preliminary reports suggest that he has a broken nose. At the end of this futile season, nothing was more important than Amed Rosario’s development. That development was cut short on Sunday afternoon when the young shortstop was removed with a right index finger contusion. Rosario had the finger wrapped and iced, and although it swelled, X-rays were negative. Thankfully, he should be back in a few days. Asdrubal Cabrera turned a nifty double play against the Reds on Aug. 30.